A black hole after all. Credit: ESA. Illustration by Martin Kornmesser, ESA/ECF. 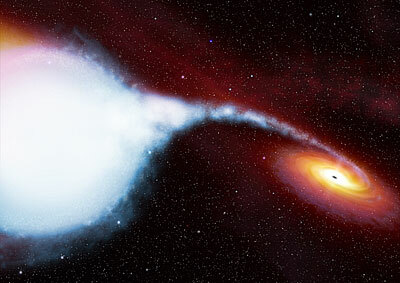 Using a vast array of radio telescopes, astronomers in North America are the first to make a direct measurement of the distance to Cygnus X-1, allowing them to conclude that the mass of its dark star is so great it can only be a black hole. They have also discovered that the black hole spins faster than most of its peers. "There's no doubt about its distance now, and there's not much uncertainty anymore about its mass," says Mark Reid of the Harvard-Smithsonian Center for Astrophysics in Cambridge, Massachusetts. "It's definitely a black hole." A black hole is a star that has run out of fuel and died, collapsing into a small body with such enormous gravity that nothing escapes its grip. First identified as harboring a possible black hole in 1971, Cygnus X-1 was one of the first sources of x-rays discovered by astronomers. It is found in the constellation Cygnus the Swan, also known as the Northern Cross, and is one of the most studied objects in the sky. It even inspired a 10-minute song by the Canadian rock band Rush about how the stars of the Northern Cross were "in mourning for their sister's loss." However, some scientists were skeptical of its black hole and in 1974 Stephen Hawking bet Caltech's Kip Thorne that Cygnus X-1 did not have a black hole. Instead, the dark object might be a neutron star, a less extreme type of dead star. The key to the controversy involved a mundane fact: its distance from Earth. The dark star in Cygnus X-1 orbits a hot blue star every 5.6 days. But without knowing its distance from us, no one could say how much light the blue star emits. The closer Cygnus X-1 is to us, the less powerful this star must be, therefore the less mass it must have. And the less massive this star, the less mass the dark star whose gravity tugs the bright one has. If the dark star has less than three times the Sun's mass, it could be a neutron star rather than a black hole. Recent distance estimates have favored a higher mass--Hawking conceded defeat two decades ago--but these have been indirect. The best way to measure distance is through parallax--the small shift in a star's apparent position that results as we view it from different perspectives while Earth goes around the Sun. But Cygnus X-1 is so distant that optical astronomers can't measure its tiny parallax. Fortunately, Cygnus X-1 emits radio waves, so Reid and his colleagues took aim at the object with the Very Long Baseline Array (VLBA), which consists of ten 25-meter radio telescopes scattered from New England and the Virgin Islands to California and Hawaii. This huge array measures positions 100 times better than the Hubble Space Telescope. "Cygnus X-1 produced beautiful data," says Reid, "and we were able to get a very accurate distance." The parallax indicates that Cygnus X-1 is 6050 light-years from Earth, with an uncertainty of just 400 light-years. From this the astronomers deduce that the dark star is 14.8 times more massive than the Sun; the uncertainty is just one solar mass, so the object is far above the dividing line between neutron stars and black holes. The blue star it orbits is even more massive, at about 19 solar masses. "The radio estimate of the parallax is a wonderful achievement," says Douglas Gies, an astronomer at Georgia State University in Atlanta who is not affiliated with the research team. "It is an extraordinary result." The researchers also found that the black hole spins at 97 percent of its maximum possible speed. They deduce this by observing x-rays from a disk of hot gas that whirls around the black hole--gas that the black hole has torn from its unfortunate partner. The general theory of relativity says that the faster a black hole spins, the closer an object can circle it on a stable orbit. The part of the gaseous disk closest to the black hole is the hottest. For Cygnus X-1, the inner edge is so hot that it must be very close to the black hole, thus the black hole spins fast. The gas at the disk's inner edge revolves at half the speed of light, completing 670 orbits every second. The astronomers have submitted three papers to The Astrophysical Journal, one on the distance, one on the mass, and one on the spin.